We are pleased to announce that a new page has been added to the Teaching Folder. The Establishing Meaningful Practices page seeks to "get to the rough ground" and emphasise the importance of establishing effective practices in home, school and community environments, which are based on quality teaching principles. We are interested in contrasting what may appear as sporadic, isolated activities with those activities that are carefully arranged and which contribute to the development of meaningful literacy skills. A practice “is something people do, not just once, but on a regular basis. But it is more than just a disposition to behave in a certain way; the identity of a practice depends on not only on what people do, but also on the significance of those actions and the surroundings in which they occur.” (Stern, 2004, pg 166). For some reason, people pray, brush their teeth, complete their tax, hike in National Parks, long for the next dance, etc. Each “activity” is part of - let’s says - religious practices, hygienic practices, economic practices, artistic practices, social practices and more. Each practice is much more than the sum of its parts. For instance, the combination of prayer, worship, scripture, and stewardship amounts to more than a collection of disparate activities. They amount to a form of life, and they rely upon resources, other participants, a sense of attachment, cultural artefacts, instruction (or initiation) and more. Likewise, literacy involves the orchestrations of many experiences which culminate in the fostering of the literate practitioner. Time and space must be carved out in the great hurly burly of life so that the practice can grow, flourish and evolve. So ... how do we make certain activities part and parcel of the practices of home, school, the community, etc? What are the material and social conditions that make this happen? What role do adults and peers play in establishing the conditions of a practice? Is it realistic that all budding "apprentices" will have access to "teachers" (including parents) with sufficient expertise and wherewithal? Overall, how does something become a practice and, through practice, how does the learner's engagement with the world change? 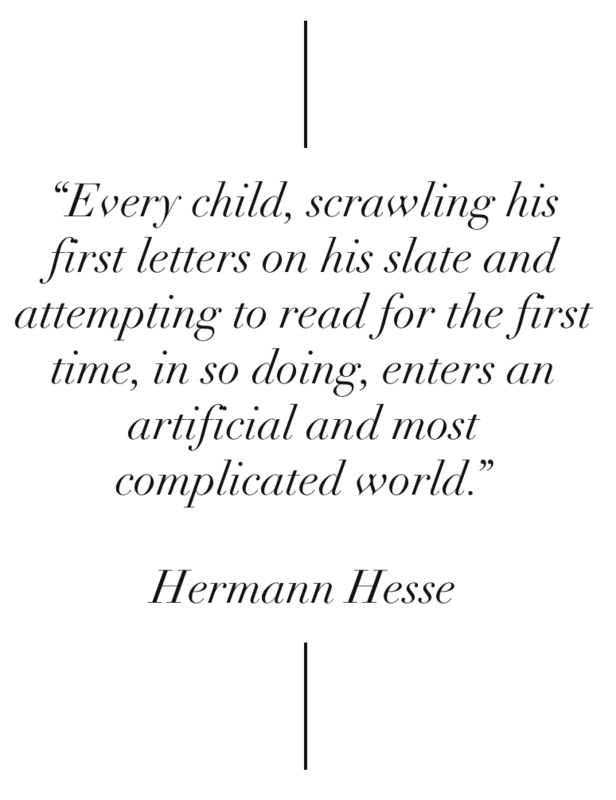 Please click here to explore the Establishing (Literacy) Practices page in the Teaching Folder. This entry comes with a sense of accomplishment. We are pleased to share two (new) essays that reflect important principles from Wittgenstein On Learning. As with many of the essays, both essays initially appeared in the Journal and have been revised and updated for the Essays Section. One essay appeared fairly recently in the Journal (3 July) and it is titled A Framework For Considering Literacy Instruction. The essay seeks to provide a framework for comprehensive and balanced literacy instruction which reflects the developmental stages of literacy and the multifaceted nature of language development. The other essay is a more expansive attempt to cover its topic. It first appeared as a five-part series starting in January and it now exists as a unified essay that comes in at over 7,000 words (which - in hindsight - is not very much). It focuses on our practices and it is entitled Why Do We Do What We Do?. Taken together both essays reflect upon two principles that underpin the themes on this site: how we come to see (read) in particular ways and how we come to act (practice) with others within a community. Please explore and enjoy! McKenna, M. C., & Stahl, K. A. D. (2012). Assessment for reading instruction. 2nd Edition. Guilford Press. keeping a pulse on a learner's development, interests and motivation. Human language is a practice and it involves practice. That practice involves attending to and mastering salient aspects of language. Whilst spoken language is arguable developed by all, literacy is the acquisition of a code that many take for granted. This development is incremental and moves through stages. Adults must be ever vigilant and sensitive to this development. At every stage it is important to emphasise and model that language and literacy should be meaningful, purposeful and about discovery. The teacher’s role is to help the child by arranging tasks and activities in such a way that they are more easily accessible. The teacher must also ensure that adequate time and space is made available (especially in the great hurly burly of contemporary life). It is important that learners achieves closure. This requires an introduction to the routines, habits and ways of using language and literacy as mediating tools. It is vital that the learner has adequate time and space for this engagement (a) to be modelled for them, (b) to participate in guided practice, and (c) to try out new strategies and skills on their own. We should not underestimate the important role that emotional commitment and attachment plays in the intake, uptake and embodiment of learning. We must acknowledge that all learning is conducted with others in context and is dependent on access to tools and resources. It is important to recognise that there are multiple ways of reading/writing and it is vital to create contexts where a range of literacies can be developed. An individual's reading and writing practices become more specialised as he or she grows into social, community and economic spheres. Teaching practitioners must be aware of the material and social factors that impinge upon an individual's successful development of a range of language, literacy and learning practices. Cavell, S. (1969). Must We Mean What We Say?. New York: Charles Scribner's Sons. Moyal-Sharrock, D. (2010). Coming to Language: Wittgenstein’s Social “Theory” of Language Acquisition. In SOL Conference 6-8 May 2010. Bucharest. Snow, C., Barnes, W. S., Chandler, J., Goodman, I. F., & Hemphill, L. (1991). Unfulfilled expectations: home and school influences on literacy. Cambridge, MA: Harvard University Press. The video in this journal entry is an ABC News piece that can be examined through a Wittgensteinian perspective. The topic is talent, and the article examines what contributes to the realisation of talent (or ability). In brief, the news item makes reference to the book The Talent Code by Daniel Coyle and emphasises that the important roles of hard work (practice), effective teaching, and access to the space and time for total concentration. Isn't this common sense? How else would success be achieved? Surprisingly, this picture contradicts another prevalent world picture that is sustained in the American public and media; that is, there are those in the community who exhibit extraordinary talent which can launch these individuals into the heights of the culture through their innate ability alone. In the words of Coyle, "talent is the last magical thing. It's magic ... Tiger Woods is magic. Michael Jordan is magic. Mozart was magic." Contributing factors such as context, culture, practice, relationships and circumstances are pushed to the periphery because they may threaten to unseat the prevailing mythology that some people are just amazingly talented. One would prefer to believe in genius, luck, and egalitarianism rather engage in deeper questions into the people, opportunities and culture that fosters skills and practices. The ideas presented in the video do not deny that innate ability plays a role in the realisation of talent; however, the ideas seek to correct a misleading view, which is one that wants to forget that other key factors play vital roles in the fostering and maintenance of talent.